A study led by researchers at the Global Change Unit at the Universitat de València (UV) shows the impact the current 2015/2016 El Niño is having in Amazonia. Areas of extreme drought and changes to their typical distribution in the region are among the most evident consequences. The El Niño effect is part of a cycle of global heating and cooling associated with the changing temperatures of a band of ocean water in the central and east-central equatorial Pacific Ocean. Repeating every three to five years, it is one of the main drivers of climate variability. Although its consequences are felt at the global level, its impact on tropical forests – particularly the Amazon rainforests – are considered particularly significant, since this ecosystem is considered one of the planet’s main carbon sinks. Some El Niño events, like those of 1982/1983 and, especially, 1997/1998, are stronger than average. In 2014 alarm bells started ringing at the possibility of another such ‘Mega Niño’, as they are known, though ultimately not all of the necessary conditions converged. However, in 2015 they all fell into place, leading to the current 2015/2016 event, which, coupled with the trend of global warming, is proving more extreme than any on record. The study, by researchers at the Universitat de València and published in Scientific Reports, shows how the current El Niño event is associated with an unprecedented heating of Amazonia, reaching the highest temperature in the last forty years and, probably, the last century. Additionally, extreme drought has hit a much larger area of this region than usual and is distributed atypically, with extremely dry conditions in the northeast and unusual wetting in the southeast (something which occurred in 2009/2010, though to a lesser extent). According to the UV scientists, this fact, not observed in the 1982/1983 and 1997/1998 events, implies that, the more the central equatorial Pacific is heated, the more marked the difference between and distribution of the wet zones and areas of extreme drought in the Amazon rainforest. Some studies associate the current context of global warming to a greater frequency of these stronger El Niño event, although no clear consensus exists among scientists. The severity of the impact of these extreme drought events on tropical forests has to do with the lower absorption rate of atmospheric CO2, as well as an increased risk of fires and the consequent loss of biomass. Currently the temperature of the Pacific Ocean is neutral, with odds at slightly over 50% of entering La Niña, the cold phase of this natural global climate cycle. However, the drought is expected to continue over the coming months. The research behind this study was carried out using climate data and temperature and rainfall records generated by the European Centre of Medium Range Weather Forecasts, the Met Office Hadley Centre and the University of East Anglia’s Climate Research Unit, as well as satellite imagery. 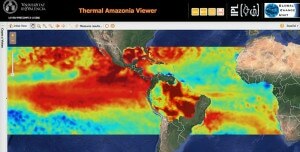 Some of these data are available on the Termal [email protected], developed by the UV’s Global Change Unit. Taking part in this research were: Juan Carlos Jiménez Muñoz and José Antonio Sobrino, from the Global Change Unit, based at the Image Processing Lab at the University’s Science Park. They were joined by scientists from the University of Chile, University of Leeds, University of Maryland, Geophysical Institute of Peru, University of Oxford and Royal Netherlands Meteorological Institute (KNMI). The study was published in Scientific Reports, from the Nature publishing group, here.